“The fool is the precursor to the savior (Karl Jung).” You have to be a fool to advance because when you first move in your new direction, what the hell do you know? You’re just a bumbling dimwit! But you won’t he that for long, that’s the thing! Some people wrongly imagine that you have to have all your ducks in a row before you start something. They will tell you you need to know not only where you are going but also the steps to take to get there before you make your first move. It sounds so good. So rational. But when speaking of breaking new ground, entrepreneurship, even spiritual entrepreneurship, uh uh! It’s so wrong! When you are trying something new, you must learn as you go. This will make some Yeshua believers I know nervous. But that’s because they have forgotten Abraham, who not only didn’t know where he was going, but also didn’t know the steps along the way! I confess to being something of a spiritual entrepreneur, although, as my wife and tax accountant can tell you, not in the financial sense. Rather, the riches that I have been privileged to create in my journeys following God’s still small voice have been of the spiritual kind: Messianic music, Hashivenu, Messianic Jewish Theological Institute, and by derivation, the Messianic Jewish Rabbinical Council, besides a rather large heap of Messianic theologizing and conceptualizing that has become common parlance for many. All of these enterprises have been all God-touched works of the Kingdom. But for me these are like nuggets lying on the ground, spiritual riches that one stumbles across along the way while following God. I am a year younger than Abraham was as I embark on my newest journey, and eleven years younger than Caleb when he challenged Joshua to “give me this mountain. . . It may be that the Lord will be with me” (Joshua 14:12). I remember a time not long ago when, because certain things unexpectedly unraveled, I had no mountains to climb and no direction to go. I don’t recommend it. It’s a terrible place to be. Far better to be as I am now, older than some people think one should be and doing what they lack the vision, opportunity, courage, or calling to attempt. At this point you are sure to meet members of The Fellowship of The Raised Eyebrow, those people whose skeptical response to your endeavor or whose “I have a better idea” is the greatest momentum destroyer this side of a brick wall. You won’t need to find such people: they will find you! One of life’s pleasures is learning to hide from them! Right now under the Interfaithfulness umbrella I am championing a certain kind of havurah as a desperately needed structure for spiritual renewal in the Jewish world, the Messianic world, and in a certain brand of house-church incarnation, in the Christian world. I am talking about household spirituality. Don’t get me wrong: in themselves, small groups are not the answer. Small groups can be just as deadly as larger ones! But the trick is to do the conceptualizing, the research, contextual analysis, praying, and field testing that will tell you what kind of small group/havurah/house church needs to be developed in particular areas and with particular populations. I started researching this stuff at the beginning of the 1990’s. Now it is time to step out and to be a catalyst for a renewal for which it seems the time has come. Associates – You will need companions in the way. It is amazing the network of team members Paul depended upon doing his pioneering work. You too will need associates: but not too many, and not the kind who will co-opt the vision. Be careful of that. I am blessed beyond blessing to have a number of associates who are the kind of skilled, capable, and committed collaborators leaders long for. Awareness – Do the work necessary to develop a deep awareness of the geographic, social, economic, and spiritual context where you plan to try things out. Attempt something worthwhile as a test case: make it affordable financially and in terms of the depletion of human resources. Assess – Assess the fruit of your attempt. What did you learn about what worked, what did not work, and why. What new insights arose in the process? Adjust – Make adjustments on the basis of experience and observations, not just your own, but among the people who you are working among. Again – Repeat all of the relevant prior steps, incorporating the adjustments you determined should be made. Go through this cycle as many times as is fruitful. Abandon – Recognize when and if a given context is just not ready for what you have to offer, or recognize when the needs of the area are over your head. Whatever the reason, it is generally good to abandon unfruitful endeavors. This was in fact an approach used by Yeshua and by Paul. Alliteration – Try to make your key terms in a list to be alliterative, because it’s so much fun! 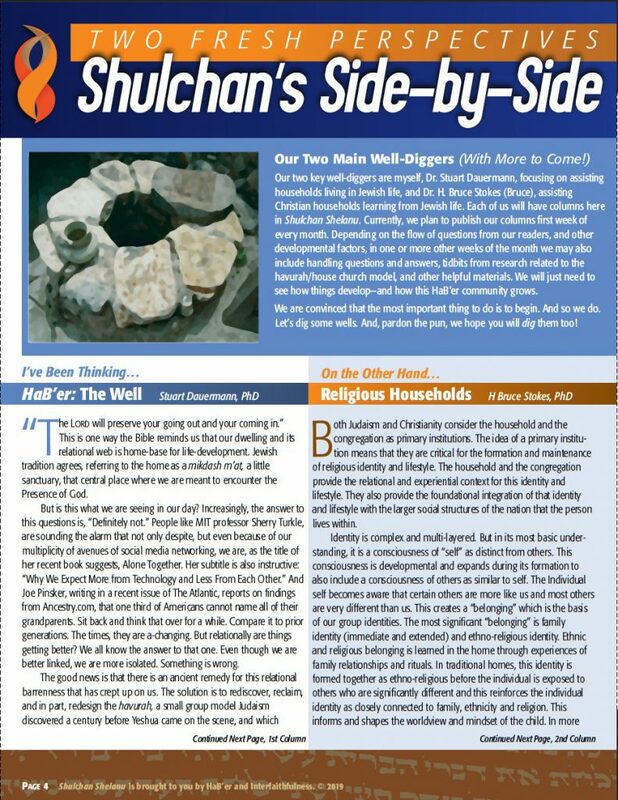 So here’s a taste of the leading edge of what we are doing right now, Shulchan Shelanu (Our Table), a Study/Discussion Sheet for use around your table for shabbat or for Sunday, if yours is a Christian house learning from Jewish life. 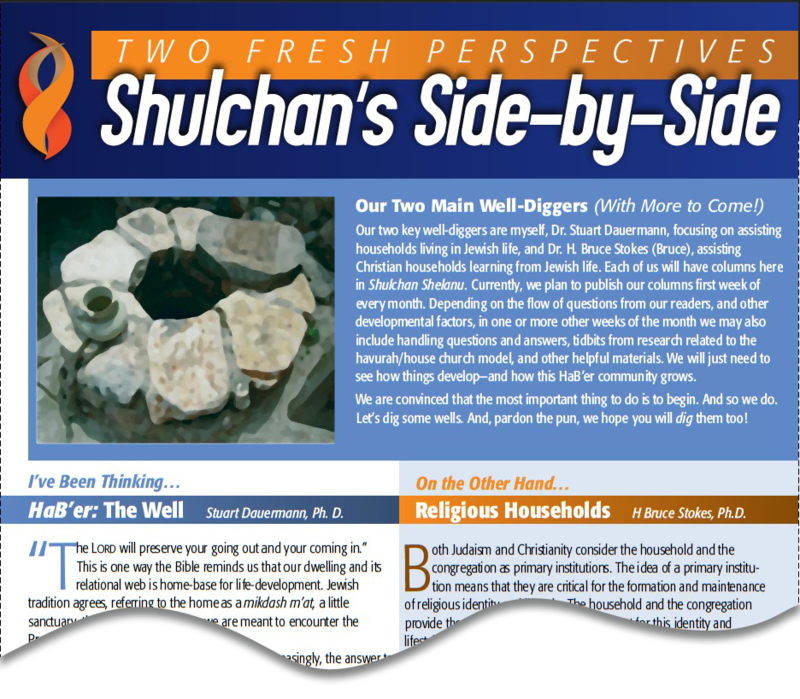 The bulk of the Shulchan is about the readings of the week, and some morsels about Jewish life. But to start with, the first week of the month we feature columns about the havurah idea–the need for it and how it should be implemented. And Shulchan Shelanu comes to you every week of the month. This attachment (below) gives you the first page of those columns as they appeared in the current issue. My colleague, Dr.Bruce Stokes, is arguable the world’s reigning expert on what Christians stand to learn from the Jews for their own spirituality. His contribution is world class. This is hot stuff! And stay tuned for so much more to come about the havurah as a structure for renewal. Come learn what you can about household spirituality.